The 1000 Guineas Stakes is a group one flat race inaugurated on 28th April 1814. It takes place in late April or early May of each year at Rowley Mile, Newmarket and is a race suited to three year old fillies (whereas the 2000 Guineas is a race for both colts and fillies). 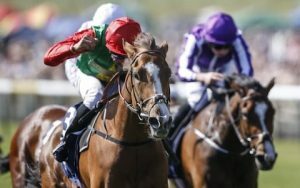 The race is run over a mile long course and is one of the five British Classic races with the others being the 2000 Guineas, Epsom Oaks, Epsom Derby and St Leger Stakes. The Classics were grouped together due to their combined history and reputation, and combined represent an opportunity to enter the history books. Minding has won two Classics, Nijinksky three. We have to go back to 1901 for a horse with four Classics wins, and that accolade goes to Sceptre. Sceptre won the 2000 Guineas in record time, then the 1000 Guineas two days later, soon after came a win at the Oaks and St Leger. Only a bruised foot stopped the Epsom Derby being added to the list. Nowadays, the 1000 Guinease takes place on the Sunday after the 2000 Guineas. As well as having the honour of being part of such a prestigeous group of races, it’s also part of the Fillie’s Triple Crown (which consists of this race, the Oaks and the St Leger. The purse for the 1000 Guineas is also fairly considerable, with a £500,000 purse for the race with over half of that going to the winner. The impact of the 1000 Guineas is felt beyond our borders, with European variations springing up in Germany, France, Ireland and Italy. Even Japan holds an event called Oka Sho, which is based on the 1000 Guineas format. Leading jockey in the race is George Fordham with seven wins, leading trainer Robert Robson with eight and leading owner, the 4th Duke of Grafton with eight wins. All of these records came in the 1800’s. In looking for a recent record, we can find one very recent one though. In 2018 the Richard Hannon jnr trained Billesdon Brook won the 1000 Guineas at odds of 66/1 with bookmakers, the biggest price in the history of the race. “I was so happy at halfway and was counting down the horses I had left to pass at the two-furlong marker. I just hoped she would keep running, but she sailed all the way to the line” said Hannon.